Faf du Plessis’ career-best and fifties from AB de Villiers and Quinton de Kock was enough for South Africa to claim a 40-run win over Sri Lanka in the fourth ODI at Cape Town, despite a century from Sri Lankan skipper Upul Tharanga. After winning the toss and electing to bat first, the Proteas managed a mammoth total on the back of Faf’s 185 and a late cameo by Farhaan Behardien. In response, Sri Lanka who hadn’t crossed the 200-mark in the ODI series hitherto got off to a brilliant start but lost their way after the fall of captain Tharanga and were eventually shot down for 327, giving the hosts a 4-0 lead in the series, which still has a game to go. 0 – No team has now won more consecutive home ODIs than South Africa’s 13. Australia (twice), Sri Lanka (twice), West Indies and New Zealand have all won 12 consecutive home ODIs and were the previous world record holders before the Proteas claimed it for themselves. 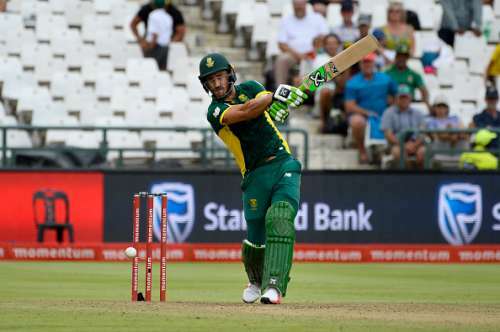 1 – Only one South African batsman has scored more in an ODI than Faf du Plessis’ 185. Gary Kirsten holds the Proteas record for highest ODI score, courtesy of his 188*. 2 – Faf du Plessis’ 185 was the second-best ODI score against Sri Lanka. Rohit Sharma’s 264 is the best. 3 – Tharanga became only the third Sri Lankan captain to score a century as an opener. Sanath Jayasuriya (10) and Tillakaratne Dilshan (1) were the other two. 4 – Tharanga’s 119 was the fourth-best ODI score by a Sri Lankan batsman against South Africa. Kumar Sangakkara’s 169 is the highest. 5 – Only five players have scored more ODI centuries at No.3 than Faf du Plessis, who has eight. Ricky Ponting holds the record with 29, while Virat Kohli, Kumar Sangakkara, Jacques Kallis and Brian Lara all have more. 6 – South Africa managed just six sixes in their score of 367. 7 – Upul Tharanga’s previous best tally of sixes in an ODI innings was four. He scored seven in the fourth ODI. 12 – No side has conceded more 350+ totals in ODIs than Sri Lanka, who have conceded it 12 times. India are second on this list with 11. 14 – Tharanga has now scored 14 ODI centuries, none of his teammates in the fourth ODI have managed even one. 23 – Courtesy of their 367, South Africa equaled India’s mark of 23 350+ scores in ODIs, which is the world record. 73 – Tharanga’s 73-ball century is the fastest by a Sri Lankan batsman against South Africa in ODIs, beating Dilshan’s record of 87 set in 2009. 128 – Before Faf’s 185, Quinton de Kock’s 128 was the highest ODI score by a Proteas batsman against Sri Lanka. 139 – The 139-run opening stand between Upul Tharanga and Niroshan Dickwella is the highest for a Sri Lankan pair against SA in ODIs. 185 – Faf du Plessis’ career-best ODI score was not only the highest in an ODI at the venue, beating David Warner’s record of 173 set last year but also the highest by a South African No.3, beating Herschelle Gibbs’ record of 175 and the third-highest by a non-opener in ODIs. 194 – Faf just fell short of Charles Coventry’s record of highest ODI score by a No.3, which was set in 2009 against Bangladesh. 329 – AB de Villiers’ 329 against Sri Lanka in 2012 was the previous best tally for a SA batsman in an ODI series against Sri Lanka. Faf du Plessis already has 369 runs, including two centuries and a fifty with a game remaining in the series. 367 – South Africa’s 367/5 was their highest ODI total against Sri Lanka beating their previous best of 339/5 in 2014.